Range of large print books and audiobooks. Collections of material for people learning to read. 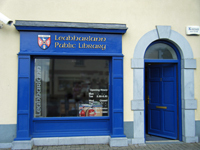 This community library offers a selection of books and audio material for all ages. In addition, it offers access to the internet and the online catalogue. Search Ballynacarrigy library's catalogue. The library holds a selection of community information. Access to assistive technology for people with visual impairment and reading difficulties is available on request. Visit the library to find out about competitions and initatives for children throughout the year.